Investors will be looking for earnings highlights this week from Oracle (ORCL), Discover (DFS) and Tiffany (TIF), which are scheduled to release quarterly reports. Elsewhere on the economic calendar, much of the focus will be on housing: The National Association of Realtors is due to deliver data on existing-home sales on Monday, the Census Bureau is expected to come out with new-home-sales figures Wednesday and release numbers on housing starts -- new residential construction projects -- Thursday. During its fiscal third quarter, Oracle continued to roll out new offerings while completing an acquisition and extending a partnership. Analysts surveyed by Thomson Reuters forecast that the company will report third-quarter earnings of 49 cents per share, up 22.4% from the same quarter last year, on Thursday. The enterprise-software giant also is expected to post revenues of $8.7 billion for the three months that ended in February. That's a 33.7% jump from a year earlier. Looking ahead to the fourth quarter, analysts expect sequential and year-over-year growth, both in earnings per share (EPS) and in revenue. Oracle earnings have topped consensus expectations in recent quarters by as much as 6 cents per share. Oracle's long-term EPS growth forecast of 14.7% tops the projections for competitors Microsoft (MSFT) and SAP (SAP). Meanwhile, Oracle's forward price-to-earnings ratio (P/E) of 14.2 is lower than the industry average, indicating a higher expectation of growth. Its price/earnings-to-growth, or PEG, ratio -- which compares its price-to-earnings ratio to its earnings growth -- is 0.9, which suggests that the company might be undervalued. Its dividend yield is 0.6% and its return on equity (ROE) is 23.1%. A consensus of analysts on First Call has rated Oracle a buy for more than 90 days, with a mean price target of $35.87 per share, and JMP Securities expects the company to beat earnings expectations. The share price hit a 52-week high of $33.71 recently, but has since pulled back to around $30. Analysts also expect Adobe Systems (ADBE) and Jabil Circuit (JBL) to post strong earnings results this week. During the quarter that ended in February, Discover expanded service to Puerto Rico, completed an acquisition and announced an agreement with Allstate (ALL). Analysts expect the Illinois-based credit-card issuer and ATM-network operator to post fiscal-first-quarter earnings of 51 cents per share, compared to a net loss of 22 cents per share a year ago, on Tuesday. But they predict that the company's revenue for the period slipped 2.9% to $1.6 billion. So far, analysts forecast second-quarter earnings and revenue will remain about the same: 50 cents per share and $1.7 billion. But Discover's earnings have grown in each of the past three quarters, easily beating consensus estimates each time. Discover's long-term EPS growth forecast is only 6.0%, lower than that of rivals such as America Express (AXP). Discover's forward P/E is 10.8, much less than the industry average. Again, a lower forward P/E ratio indicates higher growth expectations. But Discover has a PEG ratio of 1.8, which could indicate overvaluation, and a dividend yield of 0.4%. Still, analysts on average recommend buying DFS. Their mean price target for the stock is $22.12, and Zack's recently upgraded Discover to outperform. The share price has marched higher since last summer, with the stock is trading near the 52-week high of $22.34. 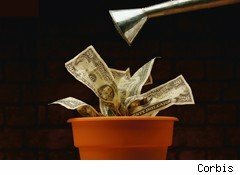 Other companies expected to post earnings growth include General Mills (GIS), ConAgra (CAG) and Darden Restaurants (DRI). Analysts anticipate that luxury retailer Tiffany will report fourth-quarter earnings of $1.39 per share, up 21.6% year over year, on revenue that increases 11.7% to $1.1 billion. During the three-month period that ended in January, New York-based Tiffany saw strong holiday sales and announced the retirement of its president, as well as share buybacks. Analysts expect full-year earnings of $2.87 per share, which would represent a 29.9% increase, on revenue that grows 13.6% to $3.1 billion. Tiffany has beat consensus EPS estimates in four of the past five quarters. The company's long-term EPS growth forecast of 14.5% tops those of competitor Zale (ZLC). Tiffany's forward P/E of 18.5 is lower than both its trailing P/E and the industry average, indicating expectations of stronger growth, while its PEG ratio of 1.3 could indicate overvaluation. Its dividend yield is 1.7% and its ROE is 15.3%. Analysts' consensus rates Tiffany a buy, with a mean price target of $67.18. But last week, the company's share price fell below $56 for the first time since November, partly due to the earthquake in Japan. Retailers Best Buy (BBY), GameStop (GME) and Walgreen (WAG) also are expected to post EPS growth in their reports this week.